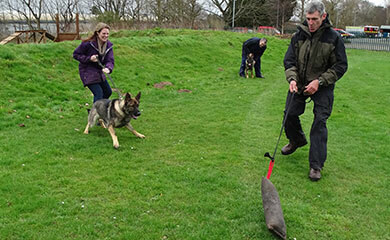 Unfortunately things have changed dramatically since our last update on the January 2017 Initial Police dog course. Pictured above are the original course members and their dogs. At the rear are husband and wife team PS Ali Cruwys with Billy and PC Steve Cruwys with Nato. In front are PC Chris Williamson with Bernie and PC Mark Pomery with Ronny. As the course progressed we have had to release Bernie at week 5 because he was unable to concentrate and focus on his tracking and in addition he wasn’t completely comfortable on shiny floor surfaces in buildings. Around the same time we also had to release Billy who also had a problem negotiating shiny floor surfaces but more worryingly lacked commitment on the criminal work exercises. We have found excellent new homes for both Bernie and Billy. 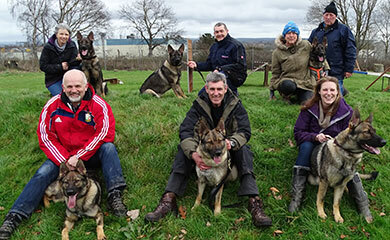 Bernie has been kept by his puppy walking family and Billy is now with Mary Simpson who is a retired Devon and Cornwall Police dog handler. 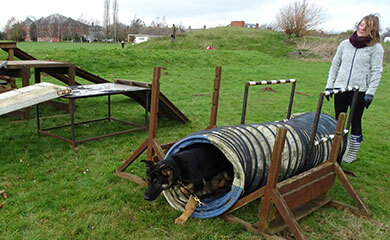 To cover for unexpected eventualities we had 2 spare dogs for the course Lenny & Bevan. Lenny has been with me since I collected him from Germany aged 4 months and I trained and prepared him for his Initial Police dog course which he successfully passed in December 2016. He has remained with me until a handler could be identified. Having taken the disappointing decision to release Billy we needed to find a replacement dog for Ali. 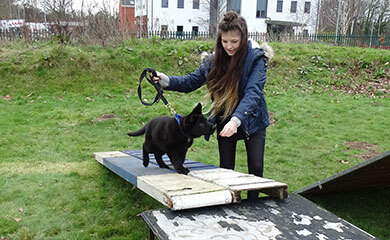 Lenny who is a very lively and highly driven dog was the obvious choice because of her experience and ability. Chris was allocated Bevan who is the litter brother of Bernie. 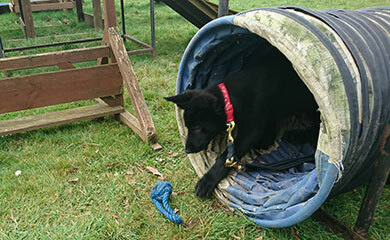 Unfortunately despite a good start it was quite apparent that Bevan just didn’t have the necessary drive and determination to be a Police dog and therefore he also had to be released from the program. Bevan like his two brother also had the dreaded curse of not being comfortable with shiny and changing floor surfaces. Bevan is a lovely dog and we have found him an excellent home with Hazel Jago in North Devon. 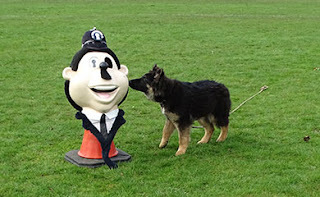 Hazel has had previous retired Police dogs from us and I know Bevan will have a great home. Lenny has settled well with Ali as the two of them start the process of completing the course and developing a bond together. 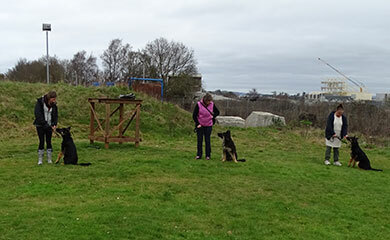 We now continue with a revised line up of 3 handlers to complete the course. On the left Mark with Ronny, Steve with Nato and Ali with Lenny. 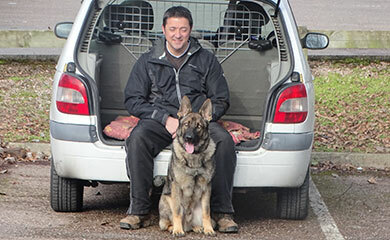 Chris has returned to Guernsey and has been matched with a 6 year old fully licensed operational Police dog. Apparently the dog’s previous handler has retired and can’t take him with him and so Chris will be his new handler. Chris only has 3 years before he retires and so hopefully it will work out well. From my perspective I feel that I have let Chris down in not providing him with a successful dog. It is my responsibility to provide handlers with suitable dogs and while you can never guarantee success there have been quite a number of dogs recently that have not graduated. Chris has shown a first class attitude throughout the course and I would like to pay tribute to him for the dignified way he has dealt with his disappointment after the weeks of attending from Guernsey and the obvious upheaval for his family. I now need to look at 2 areas to prevent or reduce the likelihood of us ending up in this situation again. Area 1 is we need to improve the quality of pups that are acquired. 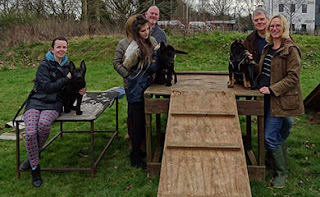 Our breeders should not be criticised because they breed excellent German Shepherds with super temperaments and their market is not exclusively for the Police but the general public. But to be a Police dog the pups need to be very tough, resilient and have a very strong hunting and tracking instinct. Clearly of late some of the pups have lacked some of those qualities and I need to increase the level of scrutiny in future selection. 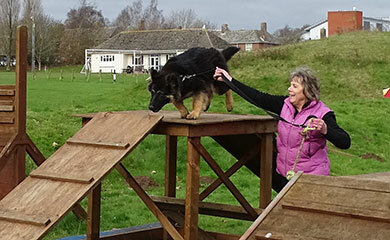 Area 2 is to provide a much more robust assessment of the dogs prior to going on the course. I will also be looking at the feasibility of purchasing adult dogs from the K10 service dog centre in Holland. I would prefer to stick with our puppy program as it has served us well for over 25 years but clearly we cannot continue with the failure rate I have experienced within the last 2 years. My thoughts and sympathies are also with the puppy walking families who have put so much into the scheme by looking after our pups only to suffer the massive disappointment of them not making it. No blame can be levelled at our puppy walkers because they religiously attend all of our training sessions and cannot do any more than they have in the development of their puppies. The buck stops firmly at my door. Here are some photos of the dog teams taken this week. The course is now in week 9. Here are Mark and Ronny at the conclusion of a successful track. 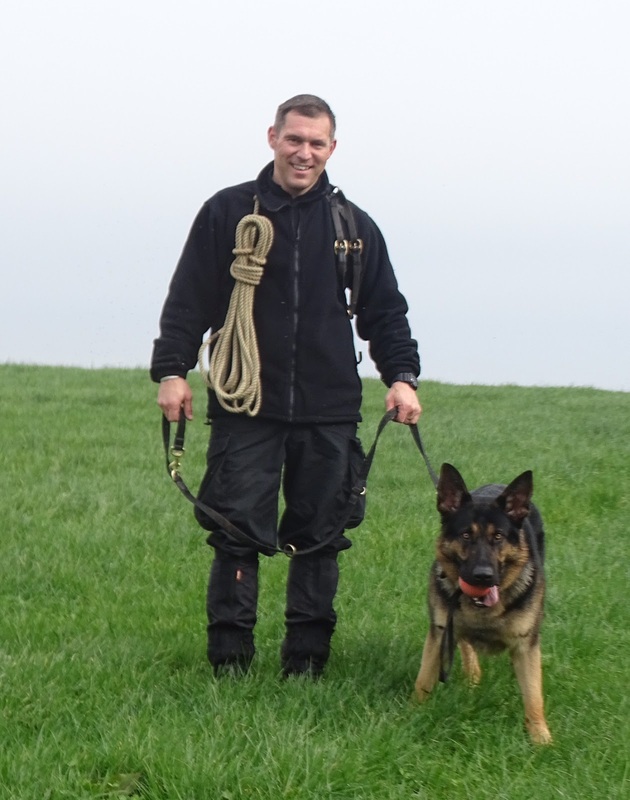 Here is Steve and Nato getting ready to track down an offender who has made of across country. Tracking down offenders or vulnerable missing persons is our number one area of work. The dog follows the trail left by the offender. 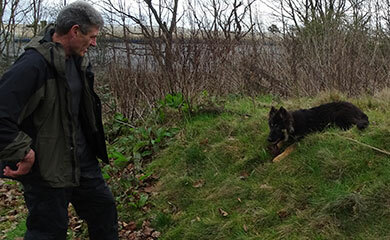 Lenny is an outstanding tracking dog and is pictured here tracking across country with Ali and locates the offender hiding high in a barn. 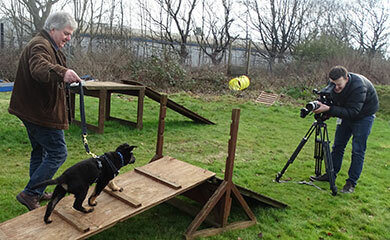 The dogs are trained to search for and locate discarded items connected to crime or lost items. They are trained to indicate to their handler that they have found the item without touching it. 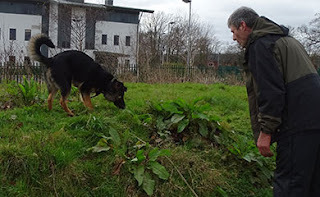 Nato is pictured here telling Steve he has found something. Ronny is telling Mark he has found something under the metal plate. Lenny is giving Ali a lovely indication that something has been hidden in the light. 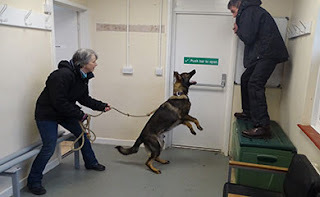 The dogs are also trained to search for hidden criminals or missing persons and Ronny is clearly telling his handler Mark that someone is hiding behind the toilet door. 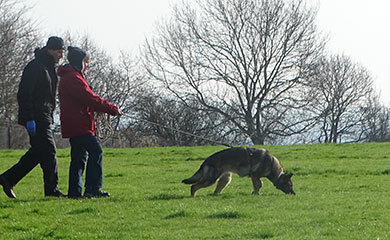 The dogs love to deal with violent or fleeing criminals both in real situations and training situations. They also enjoy dispersing violent or disorderly crowds. Here is our criminal Mark threatening the team and Nato is definitely the wrong dog to threaten. Steve doesn’t seem to be in any hurry to get Nato to let go of Mark’s arm. I'm sure Mark will get his own back when its Ronny’s turn. Control is the foundation of all the exercises that we teach our dogs and it is achieved by rewarding the dog with either titbits, a toy or praise. Here is Ronny giving Mark excellent focus and also doing distance control work in the sit and down. Here is Steve giving an excellent demonstration of heel-work and then the down stay with Nato. Steve has no excuses for not achieving the down stay because as you can see from the video Nato’s puppy walker Susannah had achieved a good standard before the course started. Not to be outdone by her husband Steve despite only having Lenny for a few days Ali demonstrates lovely focus and a solid down stay with Lenny. I am missing Lenny very much but I am comforted by the fact he is doing what he was born to do ie work. Meanwhile back at my place Rudi and Sasha are getting on very well together but they also miss him. 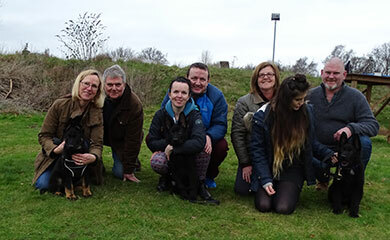 I thought I would share a photo of a Rottweiler called Ludo who was offered to our force by Rottweiler rescue. He is pictured on the far left of the photo while engaged on a local shoot. We didn’t take him into the force but we found him a home with a local gamekeeper via my friend Graham Mabbutt. Apparently he was prone to being dog aggressive. I think the gamekeeper should be congratulated. I would like to finish by paying tribute to my puppy walkers who work so hard only to suffer the disappointment of their pups not graduating. My thanks to Lynn Parlour with Bevan, Paul Minchington with Bob, Paul Sabin with Bernie and Nigel and Sue Davey with Billy. Here are the four boys practising for last years Devon County Show. Left to right, Bernie, Bob, Billy and Bevan. I want to make it clear that these were four absolutely super dogs and an excellent advertisement for the breed in terms of their character and temperament. Just as everyone is not cut out to be a Royal Marine, not every dog is cut out to be a police dog. It doesn't mean they are inferior to such dogs in any way. Having to part with Lenny and the loss of these super pups from this program has left me quite depressed but there is no time to dwell and as always I am actively working away to put what has been a very disappointing 18 months behind us. I will be doing a blog of the passing out parade on the 6th of April and I am also doing a special blog on just what it takes to go from puppy to police dog. 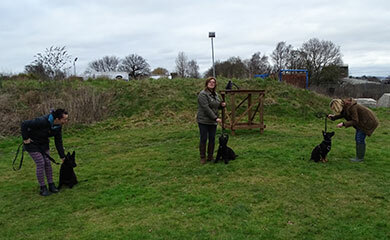 Our 3 latest additions to the program 12 week old brothers Oscar, Ozzie and Ollie attended their first training session last Sunday. We waited until their inoculations were up to date and this was their first meeting since they were allocated to their puppy walkers 4 weeks ago. 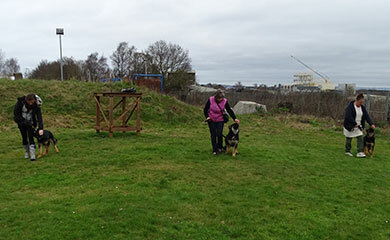 The pups will be developed in readiness for the January 2018 Initial Police dog course. We kept their first session reasonably short with an introduction to the ramps and tunnel. 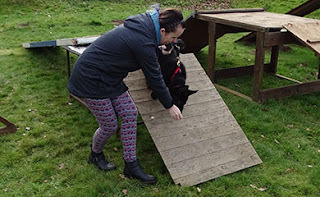 We obviously do not do any agility until they are much older because of their growing joints but we find the ramps and tunnel does help to build self-confidence. 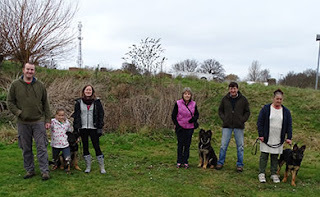 It was my intention to introduce the pups to their first tracking session but they were obviously beginning to get tired and so we called a halt to a very enjoyable get together. It was then time to say goodbye until our next session in 2 weeks’ time. 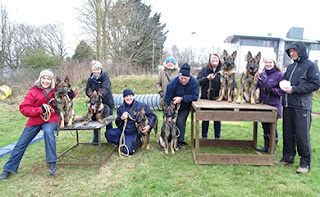 This was their second training session since arriving from Germany in early January and as you can see they are all looking in great condition. Typical of the German shepherd Tag on the left is already forming a bond with 8 year old Marina. Tara is centre and Tammy on the right. We started with a session on the tunnel and ramps in readiness for the Devon county show when most of the pups will feature over the 3 days. We don’t expect a retrieve at this stage. Once the pup locates the article which at this stage is something soft and pleasant such as a glove or rolled up sock we go hand over hand to the pup and play a tug game. 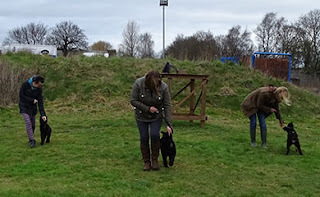 We also get the pup to release the toy on command and the release is rewarded with the article being thrown again. We also looked at their reaction to walking into the field and being confronted with an unusual object. This tells me about their boldness and general confidence. Tara went straight up to the figure with no fear whatsoever. Tag and Tammy were equally confident. Next we did some work on their sit’s, down’s and heelwork. We then did some puppy tracking using food drops and all the early indications are that all 3 pups have natural tracking ability and will enjoy their tracking work. 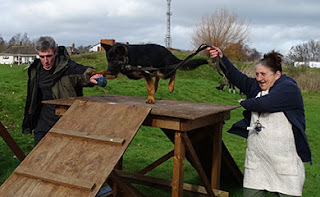 Here is Tag showing excellent concentration and as always young Marina wasn’t far behind. Still early days but Tag, Tara and Tammy look excellent prospects. On our training session 2 weeks ago all the D litter attended HQ and showed their support for # RainbowLaces acceptance without exception @DCP_LGBT. In between all the showers we all had a great training day. All the pups have it and they have clearly inherited this from their father Lenny. 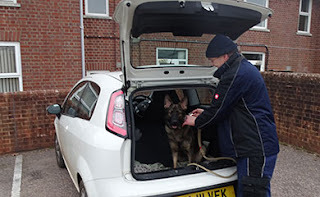 Here is Jerry arriving with Donna and demonstrating the ability to get Donna to remain calm until the lead is attached and he gives her the release command for her to get out of the vehicle. 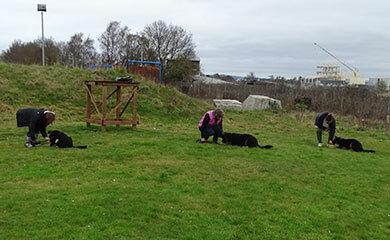 We then introduced the dogs to person searching. This is started with the dog chasing the person into a room and when he barks he/she is rewarded with their toy. Danno was well up for this game. At this week’s training session we concentrated on article searching, tracking, bite work, and the agility equipment in preparation for the Devon County show. On the article search exercise there was a prize for the best search and retrieve. Eamon didn’t take the trophy but Daisy didn’t care she loved the game. I gave the trophy to Mitzi and Danno. We all then went down to practise on the ramps and tunnel. We are still a bit rusty but it was a very good effort considering we haven’t done this for months. 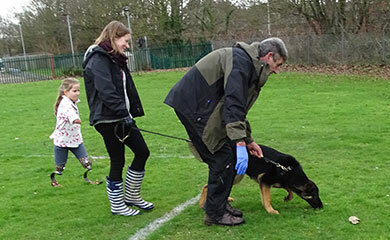 We may not be a centre of excellence just yet but who cares the puppy walkers and dogs are having a good time. We finished with an introduction to criminal work. We achieve this by getting the dogs excited over a moving bite tugger and then allow them to bite this. We eventually replace this with a bite sleeve which the criminal will wear. At the end of the session Sasha ( Front centre) the mother of the D litter joined all of her pups for a photograph. I'm sure you would agree the D litter are looking fantastic. He are the teams who attended this Sunday. Well that is an update on all of the pups. 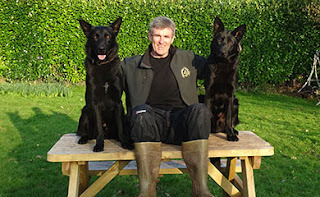 Next week I will update you on how the current Initial Police dog course is going. Today I finally handed my beloved Lenny over to his new handler Sgt Ali Cruwys and he will finish the remainder of the course with Ali. I must admit I have found this really tough but as closely bonded as we are he is a dog born to work.. Here he is on the left with Rudi on the right. I will now run Rudi on as insurance for the September 2017 Initial Police dog course but hopefully he will not be required.